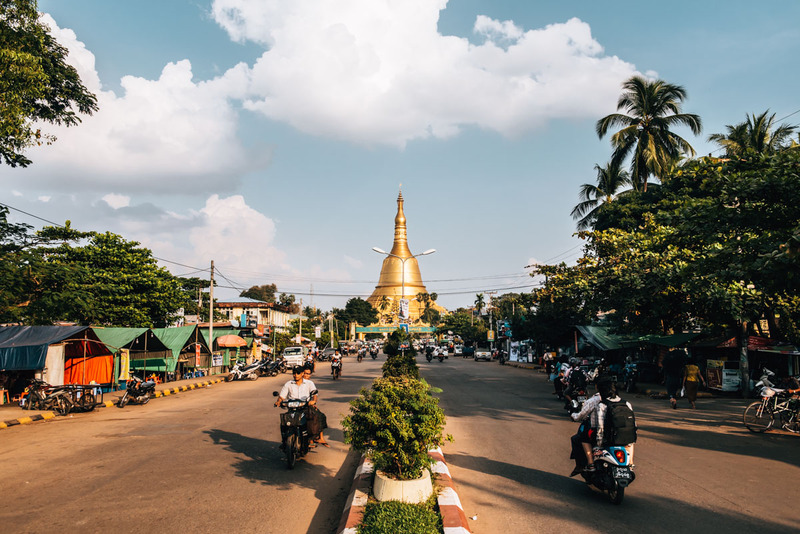 We actually did not intend to visit Myanmar’s fourth largest city, but since Bago was located rather ideally en route to Golden Rock, we decided to spend a night in Bago. 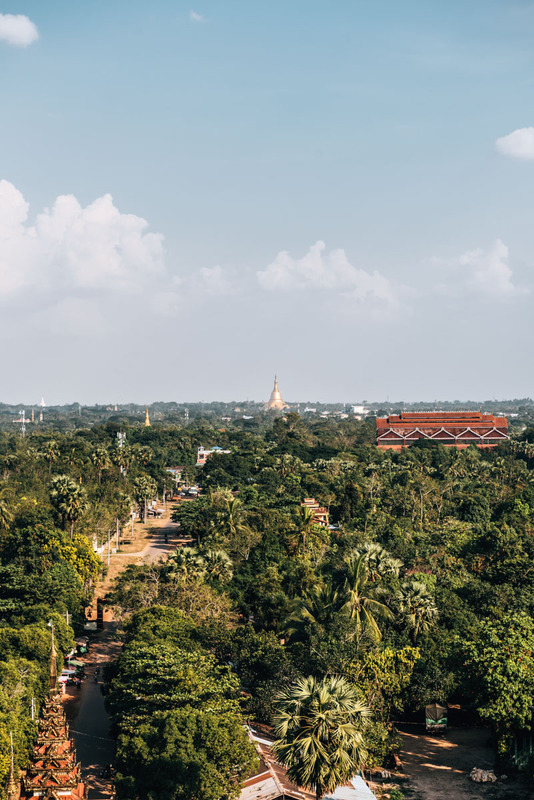 In this blog article, we’ll share with you the best sights and temples in Bago to visit, even if you only end up spending one night here, like we did. 2. Who is Bago suitable for? We came from Yangon and arrived at noon so we had heaps of time before sunset to visit the temples in Bago. The time frame might sound a little tight but luckily we had a private driver so this was actually easily done. In total, we spent about four hours exploring and in that space of time, we were able to reach six of our chosen destinations. There are, of course, many more impressive temples in Bago, but all in all, we’d say we got a rather good feel for city. Apart from the numerous temples and sights that are no doubt impressive, Bago itself did not really astound us. Quite simply because it comes with all the chaos of being Myanmar’s fourth largest city. 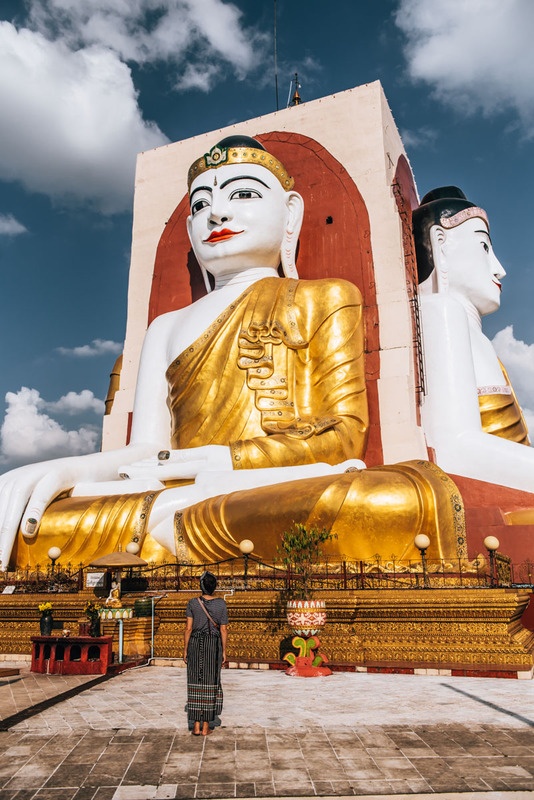 If you are interested in Buddhist temples and pagodas, then we would definitely recommend a stopover in Bago. As mentioned before, Bago is host to countless temples and many of them are well worth a visit. 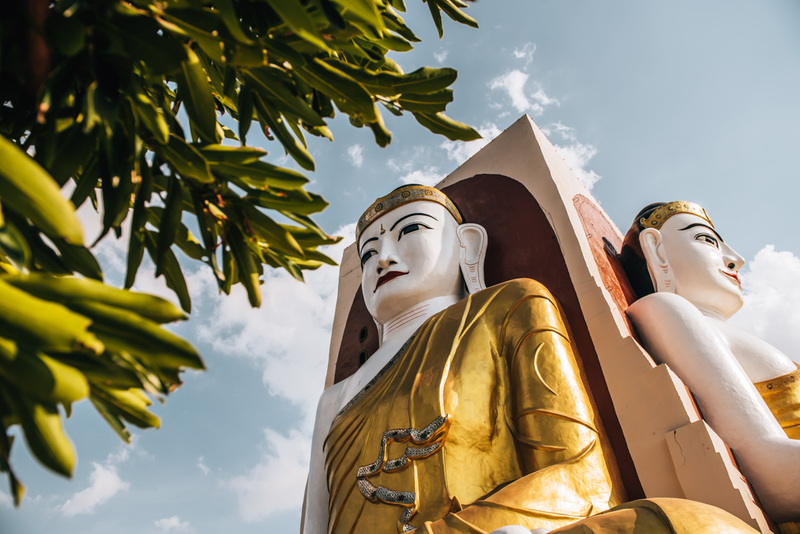 The first stop on our temple tour of Bago was the four Buddhas of Kyaik Pun and this is one we would definitely recommend to visit. Four massive Buddha statues joined back to back with each looking out in different directions. At 27 meters high, the Buddhas are a very impressive sight. With a complementary combination of white and gold, we also really liked the Mahazedi Pagoda. It’s a pity though, that this can only be climbed by men. As is the case in many sacred sites in Myanmar, like this one, women are vastly discriminated by their gender. So only Romeo was able to climb the steep stairs and enjoy the – very impressive – and expansive view over looking every direction. 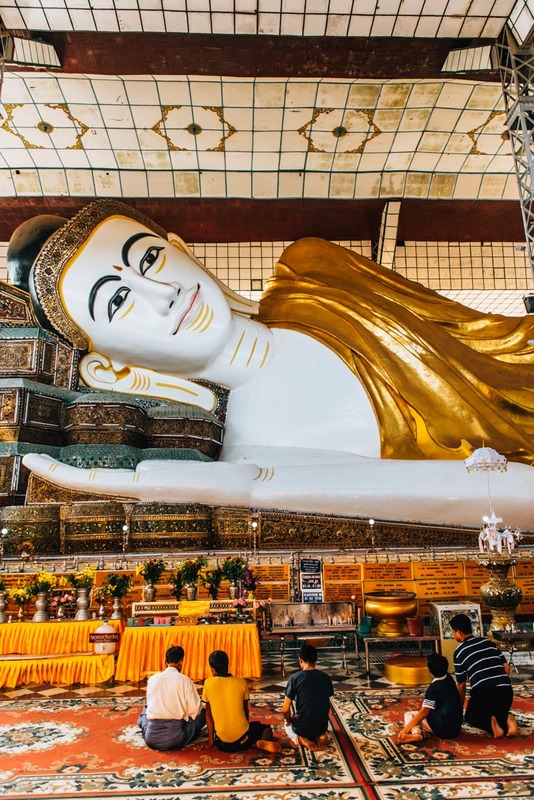 Incredible: At 55 meters in length, the reclining Shwethalyaung Buddha is the second largest reclining Buddha in the world. The dimensions are truly enormous, making this visit very worthwhile. Personally, we didn’t find the corrugated iron roofing overly flattering, but we get the fact that it’s all to protect this very special Buddha from wind and weather. Do be prepared, however, for large crowds at the Shwethalyaung Buddha. 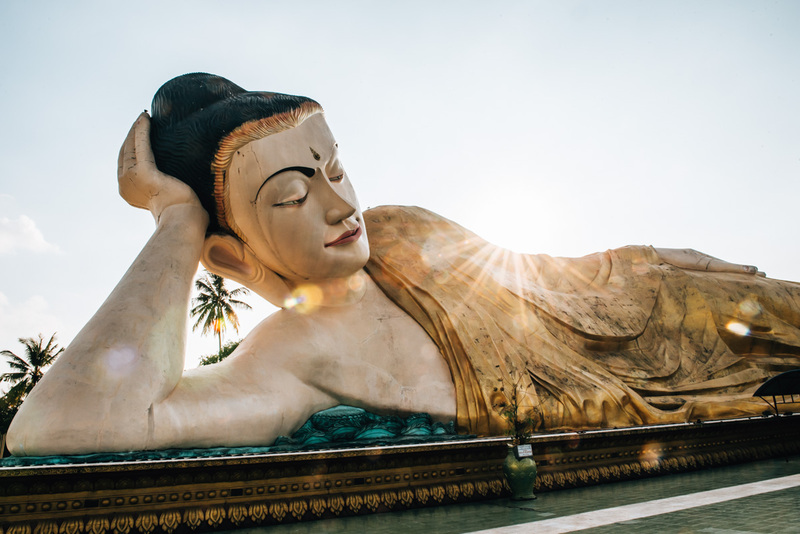 The lying Mya Tha Lyaung Buddha is much less crowded in comparison to the Shwethalyaung Buddha. Together with a few other people, we were the only ones there, relishing in the peace and tranquility. Despite the Mya Tha Lyaung Buddha being relatively less impressive and less maintained, we still found the stopover worthwhile. 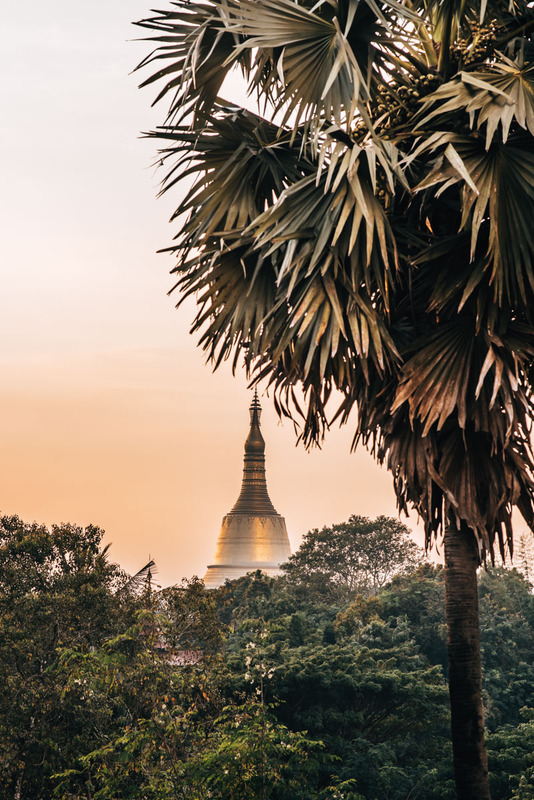 The Shwemawdaw Pagoda is in Bago, what the Shwedagon Pagoda is in Yangon – the most important sacred site of the city. Hard to believe, but the Shwemawdaw Pagoda is actually even higher than its sister in Yangon, towering a total of 114 meters into the sky. We arrived before sunset, however, would recommend waiting to enjoy the sunset colours. The last stop of our temple tour was recommended to us by our driver. 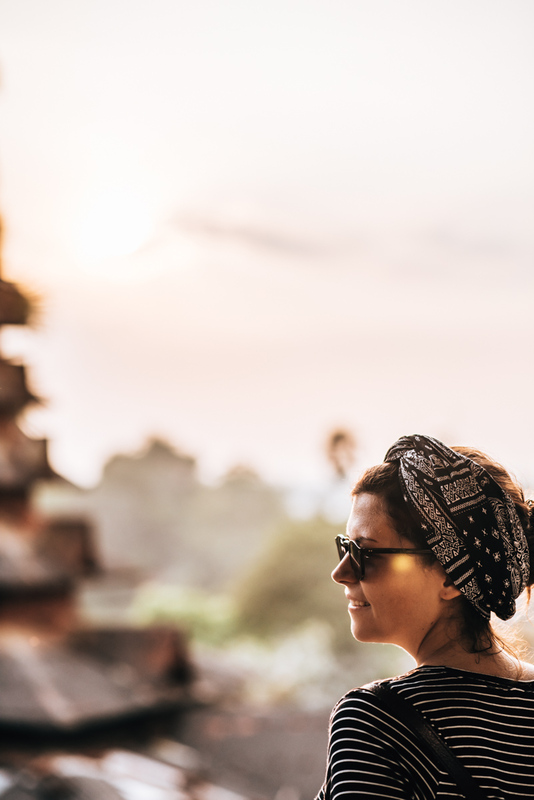 Luckily, we went along with the idea, because from the Hintha Gon pagoda, we could marvel at the beautiful sunset over the Shwemawdaw Pagoda. We did, however, find the Hintha Gon pagoda itself a little unkempt and much less impressive than expected. The highlight here is definitely the view of Bago, even though it’s a little clouded by trees and houses. Hotel offers in Bago are rather reasonable, nowadays, boasting more and more hotels that are of higher standards and very comfortable. 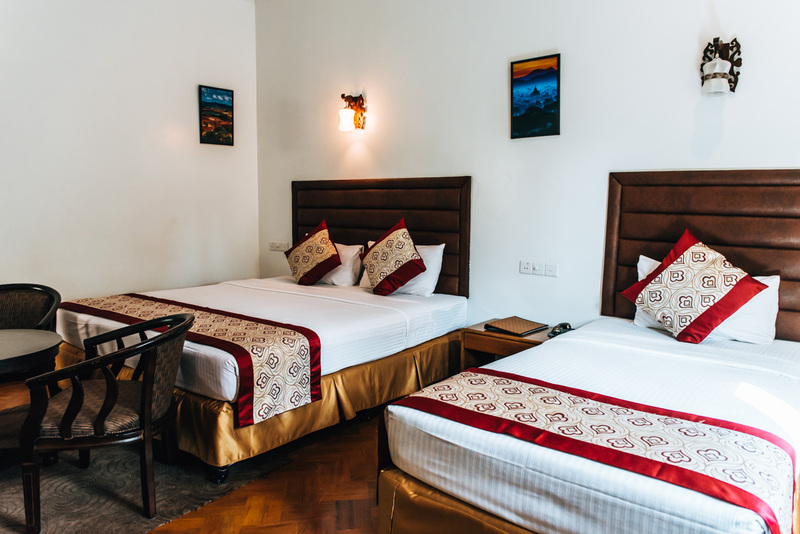 We stayed at the Kanbawza Hinthar Hotel for one night, which can recommend from our experience. Unfortunately, the cheapest rooms were fully booked, so we had to switch to a fancier room. At 66 Euro per night the Kanbawza Hinthar Hotel was one of the most expensive hotels of our Myanmar trip. The room itself was very comfortable, absolutely nothing negative to say. However, the restaurant didn’t leave us too impressed, definitely still room for improvement there. 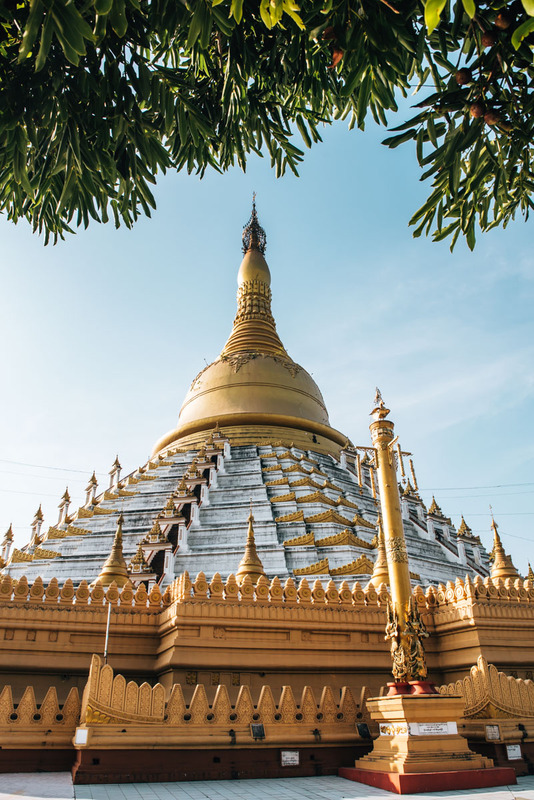 Many travellers – like us – take the route from Yangon to Bago. 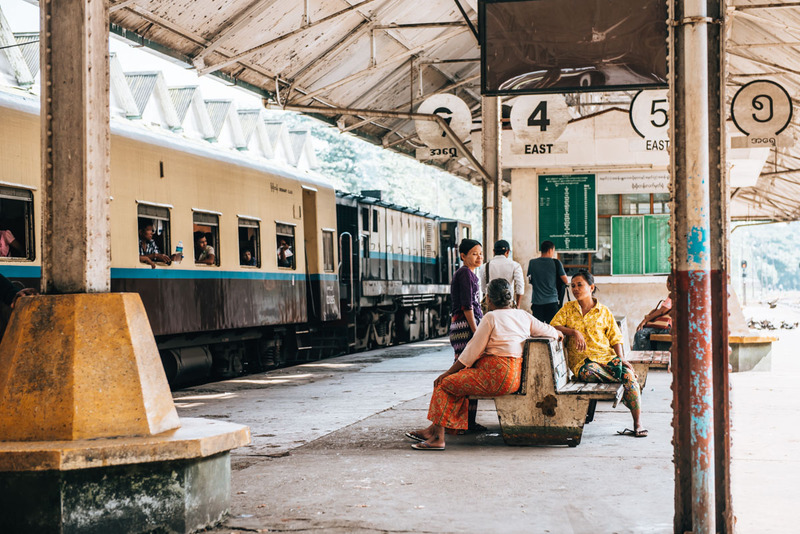 Before we arrived in Myanmar, we were certain that we wanted to experience, at least once, travelling by train. (Not to mention we had a wonderful experience 5 years ago, also travelling around Yangon by train). So this time, the route from Yangon to Bago was to be our one off train ride. Travelling by train is an experience in itself, that much we can promise you. It rumbles and jerks at a snail’s pace, but you can see the scenery go by and watch the locals living and moving about on and off the train. If, in the case, you do want to travel by train, then you have to go to the Central Railway Station. There you can buy a ticket almost right up to the departure time of the journey. We actually visited the station with the intention of buying our ticket the day before, as we wanted to fix in our travel times. 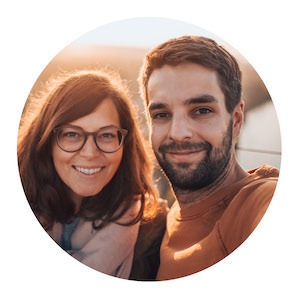 However, we found out that it’s not possible to buy a ticket the day before, thus concluding that as long as you are there about half an hour before the train leaves, you should be fine. 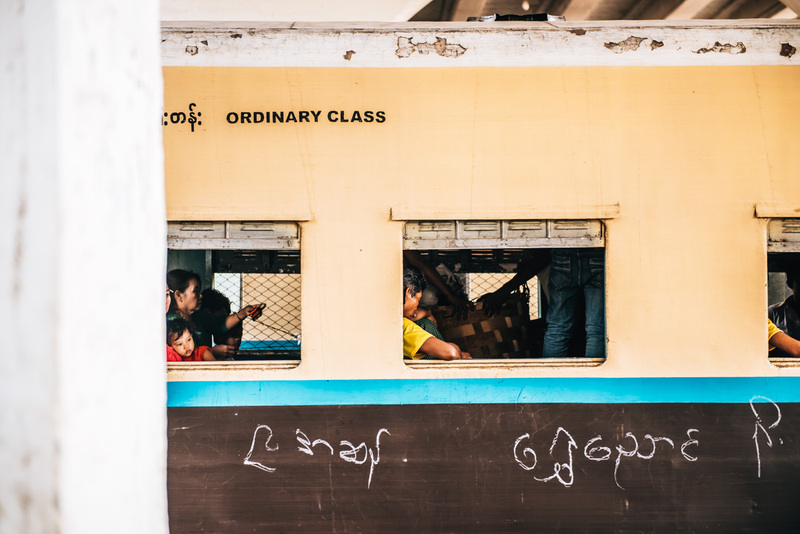 The ticket for First Class costs exactly 1,000 kyat – which is quite a bargain. Of course you cannot expect ‘luxury’ in that sense, but for the duration of the journey (2hrs) its more than bearable. Alternatively, you can also travel from Yangon to Bago by bus. This takes a little under 2 hours but costs a little more. However, we were aware of how many hours we would end up spending in buses, so the train was a welcome change. 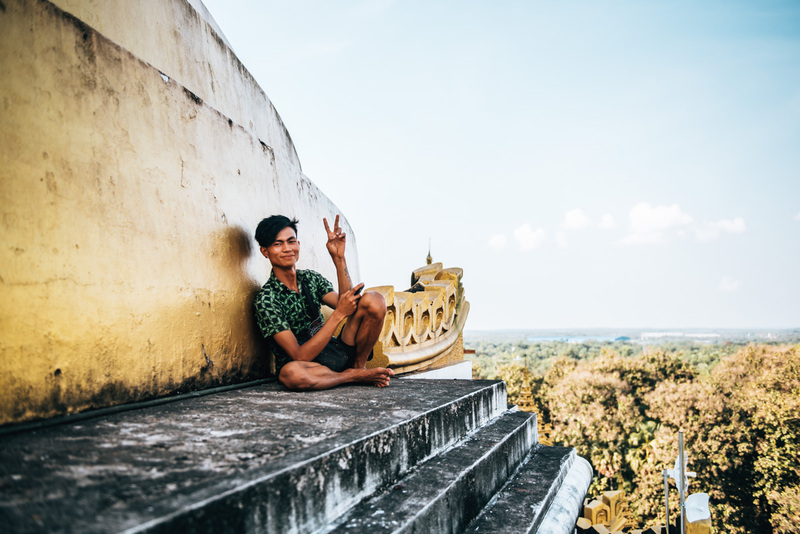 Are you looking for a detailed travel guide for Myanmar? If so, we can highly recommend the Stefan Loose travel guide. As we are familiar with the Publisher, we found the travel guide very extensive and well researched. This article contains affiliate links. If you book or buy something through these links, the price will remain the same for you, but we receive a small commission so that we can keep operating this site. Great thing, right? Thank you for your support! Have you been to Bago before? How did you like it? We look forward to your comment and review! Hi,nice blog and photos. May I ask what camera do you use?